THE upward route to the office of Dr. Jim Shmerling, The Childrens Hospitals president and CEO, is a labyrinth of bright open spaces, arching ceilings, pastel corridors and glass elevators. 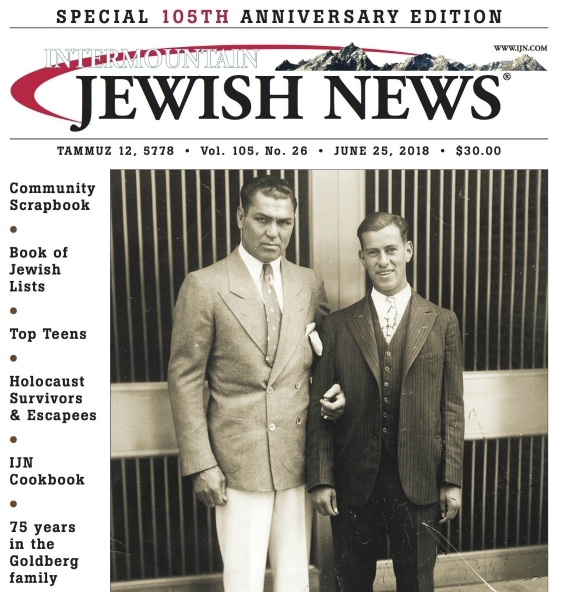 But as an adept guide leads the Intermountain Jewish News to its destination, something glues the unfamiliar pieces into an unexpected whole. From the small-statured patients to the physicians to the guy selling coffee, smiles sparkle at Childrens Hospital, which moved to its spacious location on the Anschutz Medical Campus in 2007. Thats also the first thing you notice about Dr. Shmerling, who breezes into his expansive office overlooking the mountains with the speed of invisible light. The third-generation Tennessean was hired in 2006 to spearhead Childrens major relocation from downtown, where the venerable hospital opened in 1908, seven miles east to Aurora. Its stressful enough for a single family to move into a new home, let alone an entire hospital and all that goes into such an enormous transition. As the IJN ticks off a partial list of responsibilities and challenges accompanying the task, Shmerlings face erupts with spontaneous glee. Sometimes finding the right career path takes years. Other people know instantly. For Jim Shmerling, it took about a year  but once found, his destiny was sealed. I couldnt decide whether I wanted to go into medicine, business or law, he reflects. But I always knew I wanted to do something with children. He interacted with surgeons, nurses, anesthesiologists. But career doubts persisted. Then I met the hospital administrator. He told me about his job, and I told him what I thought I wanted to do. He explained that hospital administration includes business, law, and working with medical personnel day in and day out. Those four words crystallized Shmerlings future. He returned to college and obtained numerous degrees: an undergraduate degree in public health from the University of Tennessee; an MA in health administration from the University of Alabama-Birmingham; an MA in business administration from Samford University; and a PhD in health administration at the Medical University of South Carolina in Charleston. Then he began working at various childrens hospitals, including 11 years at Le Bonheur Childrens Medical Center in Memphis and the Monroe Carell Jr. Childrens Hospital at Vanderbilt University, 2002-2006. SHMERLING, 56, deals with infrastructure, budgets, staffing, donors, financial reimbursement from insurance companies, bottom lines and bricks  the typical demands confronting hospital administrators. For Shmerling, the devil is not in the bureaucratic details. The details enable hope, healing, research, medical discoveries and the eradication of illness through prevention. It starts with a passion for health, he says, and how we can have an impact on kids  not just restoring their health, but preserving it. Thats one of the reasons childrens hospitals are different. There are some very good hospitals in Colorado, and they are excellent when it comes to restoring health. At a childrens hospital, a big part of the mission is working with the physician community to keep kids healthy and out of the hospital. A lot of the things we do at Childrens are performed outpatient and are preventative in nature. Insurance companies pay only for services that restore health  not for prevention. Part of what makes this job so challenging is figuring out how we can do the right thing for kids and remain financially viable, he says. For example, Childrens has purchased a license on a web-based health curriculum that will be put into four or five school districts. Were providing the program for free, Shmerling says. The schools have no money. They cant afford it. Insurance companies dont cover that as a covered expense. So whos going to pay for it? We are. At least 50% of Childrens Hospitals patients are on Medicaid. The physicians who work there, he says, are not in it for the money. Medicaid reimburses doctors below cost  at about 10 cents on the dollar. JIM Shmerlings grandparents both came to the southern US from Minsk, Russia. His fathers family settled in Augusta, Ga., and his mothers family chose Nashville. His dad, only 16 when he was accepted at Vanderbilt University in Nashville, decided he wanted to be an internist. His parents first met in Nashville, and the rest is history, their son says with a twinkle in his eye. Shmerling says his father was raised Orthodox, and his mother grew up Reform. Ironically, his future wife Debbie, whom he met in Nashville in the 1970s, was Orthodox at the time. The couple has four children, Marc, Phillip, Bryna and Erin. He throws in an amusing aside. I swore Id never live in Memphis because Nashville and Memphis are big rivals, he says. I swore Id never go to the University of Tennessee because we were big Vanderbilt fans. And I swore Id never get married until I was 30. AS plans for relocating Childrens Hospital to the Anschutz Campus moved full speed ahead, Childrens contacted Shmerling at Vanderbilt Universitys new childrens hospital, which he had successfully guided to completion. Shmerling, a man of many anecdotes, deftly pulls another from his sleeve. A Google search of Dr. Jim Shmerling pulls up several black-tie affairs that hes attended with Debbie. When I was hired, they told me this was a two-tux job, he nods. Due to the recession, Childrens total contributions slipped by 20%  but the number of contributors increased significantly. The Shmerlings, who belong to the HEA, keep kosher. At social functions, Denver caterers willingly accommodate the couples dietary restrictions or have been alerted to their needs in advance. We rarely have to send anything back, like we did in Nashville, he says. WHILE Shmerling doesnt spend a lot of time with patients at Childrens  he learned when he was younger that management best fits his skill set and desires  he is deeply committed to improving their lives. Sometimes the success stories he shares are bittersweet because they ultimately surrender to overwhelming medical odds. Yet as long as there is life, hope persists  loud and strong. The research component, a synergistic collaboration between the Childrens Hospital Research Institute, the University of Colorado Hospital, UCD School of Medicine, CU Health Sciences Center and other campus institutions, creates a very stimulating environment, Shmerling says. When Shmerling began his career, the mortality rate for children with cancer was 90%. Today, most pediatric cancers have an astonishing 90% survival rate. Shmerling has consistently fought to create a happier environment for his struggling young charges. He points to a photo on the adjacent wall. Ayoung boy is about to throw a basketball. Bald due to chemotherapy, still battling cancer but releasing a 100-watt smile, he stares beyond the camera at a distant net finally in reach. Letterman obliged and turned a wish silently harbored by many children into a reality. On the opening day, the Indianapolis press turned out in droves. They put this picture on the front page, Shmerling says. Cystic fibrosis is still fatal. While there is no cure, life expectancy has quadrupled due to improved treatment and protocols. Some children afflicted with the disease are now living well into their 40s, while others have surpassed 50. Shmerling tells another story which describes one of the most momentous occasions Ive ever witnessed. It was early in my career. We had two kids with cystic fibrosis at the hospital who were about 17 or 18. They had already exceeded their life expectancy and were at the tail end of the disease. These two kids fell in love, and we had a wedding for them at the hospital. They both knew they werent going to survive. But we helped them get to a point where they could experience this love. CHILDRENS Hospital has one of the most respected pediatric cardiac transplant programs in the US. Infants facing certain death receive new hearts that allow them to touch the impossible  the future. Yet infant heart transplants can raise some of the most anguished ethical dilemmas known to humankind  the loss of one baby so that another might live. If too much time elapses after an infant dies, the donor heart is no longer viable for transplant. It is the duty of physicians, the transplant team and others to confront parents grieving a horrible loss and gently convince them to give the gift of life. Its a huge debate for our ethics committee, Shmerling says. If a child dies, at what point do we talk to the parents about a heart donation? Even the definition of death differs. Does it occur when the heart stops beating? When brain waves cease? Advancements in technology and diagnostic capabilities are generating a plethora of new ethical questions that defy simplistic solutions. Childrens Hospital will soon institute a high-risk obstetrics service that can diagnose a fetal complication in utero. There are certain heart defects where the umbilical cord is circulating blood in the fetus, Shmerling says. But as soon as the baby is born and the umbilical cord is cut, the heart stops functioning properly and the baby dies within minutes. Now that we can diagnose that defect in utero, we are faced with a choice: we can do the procedure in utero or hover over the mother until she gives birth and rush the newborn straight to the operating room. Acouple of months ago, the hospital invited an 18-year-old who received a heart transplant as an infant (and another transplant this past May) to a board meeting to talk about her experiences. Bringing the patient and family into the boardroom humanizes that cold, hard science and makes it real, he says. This girl is a normal teenager now because of the benefits of that science. It puts everything we do at Childrens Hospital into perspective. I think working with sick children makes you realize that adults often get heart disease because of poor choices weve made regarding lifestyle, exercise, nutrition, smoking, he says. Shmerling chose to work in childrens hospitals. Physicians go to med school and come out hundreds of thousands of dollars in debt, yet choose to go into pediatrics, which does not pay well, he says. Considering the intricate demands of his position  balancing the wondrously possible with sadder, inevitable ends  Shmerling is a remarkably happy man. Similar to what the IJN glimpsed on its way up to this office, his engaging smiles far outnumber even the suggestion of shadows. I love what I do, Shmerling says. Ive been doing this for 31 years and I still get up every morning excited to come to work. This morning I woke up at 5:30 a.m. thinking about things I have to do. And Im not a morning person. Sometimes Im really impatient to get things done, he admits. And my staff says, You may have a good idea but theres a process we need to go through. And theyre right. But Im 56. I have maybe 10 or 15 years I can continue working. I have so many ideas, so much I want to accomplish, that Im always trying to move faster.